Place all of the above ingredients, except for the potatoes; you will add these the last 30 minutes of cooking, into a soup pot and cover with water. Salt and pepper to your taste. We like it pretty peppery. But it is completely up to your tastes how you season it. 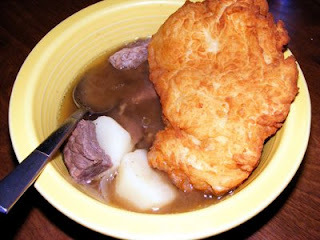 Once the meat is tender and the broth look rich add your potatoes. This should be the last 30 minutes of cooking. Serve with fry bread and your meal is complete. I will post my fry bread recipe another time. What are you waiting for, get cooking! !